Product #20715 | SKU 3218 | 0.0 (no ratings yet) Thanks for your rating! This is an Impact Convertible Boom Arm/Light Stand. 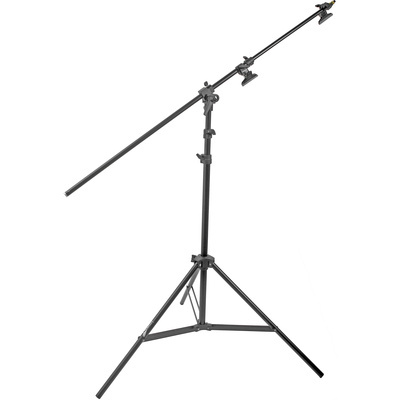 As a light stand, it can support a small or medium light head to a height of 13' (4 m). Raise the second section completely, click, and it is a boom stand. As a boom, it can hold a small light head to an extension of almost 3' from the center of the stand. It is a reflector holder by means of its two clips, which can support an Impact, Flexfill, or Photoflex light disc as large as 60". A hole at the end of the arm allows an optional counterweight to be hung, for greater stability. Loosen the top-most section of the stand. Pull that section all the way up. Pull! - swing it horizontally for the boom feature, and lock it for the desired setup.